Back any of the sides in today’s encounter at Anfield with Premier League Goal Bonus; every time your selection scores, you’ll get £5 Free Bet! 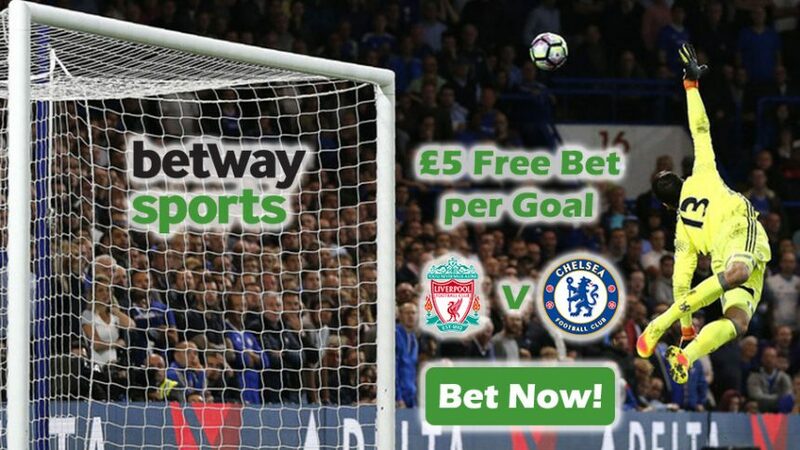 Get in on the action before the kick-off tonight at 21:00 CET with Betway Sports for a chance to earn yourself £5 Free Bet every time your backed side scores a goal in the Liverpool v Chelsea match. The Premier League Goal Bonus can see you get up to £25 Free Bet in total, but just make sure you that you place a pre-match wager on the game (Win/Draw/Win market). Taking into account that both sides have been playing attacking football this season, you can expect to profit from the Premier League Goal Bonus. Maybe not to the full extent of £25 Free Bet, but you’ll definitely get something to wet your beak with! Although their 13-game winning streak ended on January 4 when they made a visit to White Hart Lane to play the Tottenham which ended with a 2:0 loss, Chelsea bounced back to their winning ways in the next two games. With 55 points to their name, they’re leading the Premier League table, while their tonight’s opponents Liverpool sit 10 points below them, in fourth position. But to get the maximum value for the Premier League Goal Bonus, you’ll want to know the goal records of both sides facing each other at Anfield. After 22 rounds in the English top flight, Chelsea have found the back of the net on 47 occasions, while Liverpool have been even more prolific in front of goal, with 51 strikes heading into the oppositions’ net. Liverpool’s winger Sadio Mane – who was brought in from Southampton over last summer – has bagged 9 goals in 19 Premier League appearances, while Chelsea’s fierce attacker Diego Costa already has 15 goals to his name in 20 league outings. Definitely keep an eye out for them at Anfield tonight, and don’t forget to place a wager on the Win/Draw/Win market to scoop the Premier League Goal Bonus. Back any of the sides in the Liverpool v Chelsea match and win up to £5 Free Bet (max £25) for every goal that your selections scores with the Premier League Goal Bonus. Betway’s Premier League Goal Bonus gives out £5 Free Bet for every goal scored!